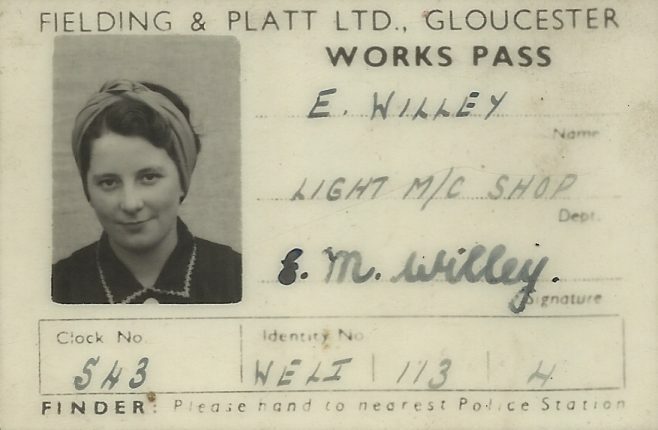 On 6 May 1942, Edith May Willey (aged 20) came to the Gloucester training centre from Plymouth to learn to work Capstan Lathes. After completing her training, she was employed on such lathes in the Light Machine Shop at Fielding and Platt. There she met Arthur Williams, then an apprentice machinist and later a centre lathe turner, whom she married. It was usual for such female workers to assist apprentices in the Light Machine Shop during the Second World War. If you remember Edith or Fielding’s female wartime workers please share your memories by adding a comment at the bottom of the page. Click on the hyperlink to see a photograph of Fielding’s female workers during World War II. In clip 5 on Daphne Collier’s page, Daphne remembers workers from Plymouth coming to work at Fielding and Platt. Click on the hyperlink to visit Daphne Collier’s page. Click on the hyperlinks to read more about Edith’s husband Arthur Williams (a machinist and centre lathe turner) or her father-in-law Henry Arthur Williams (foundryman and company gateman). Arthur and Edith were my grandparents. Sadly missed but never forgotten. Thanks for the efforts in making this available. Six female wartime workers and "Harold"?